New look: now it’s the URL reports’ turn! Since May, we have been changing the SEMrush user interface; and the URL reports have been waiting patiently for their turn to be redesigned. Finally, they have a brand new look and data-visualizations! • Backlinks Data provide a summary of a URL’s referral traffic (7). With the floating menu (8), you can easily slide up and down the page. 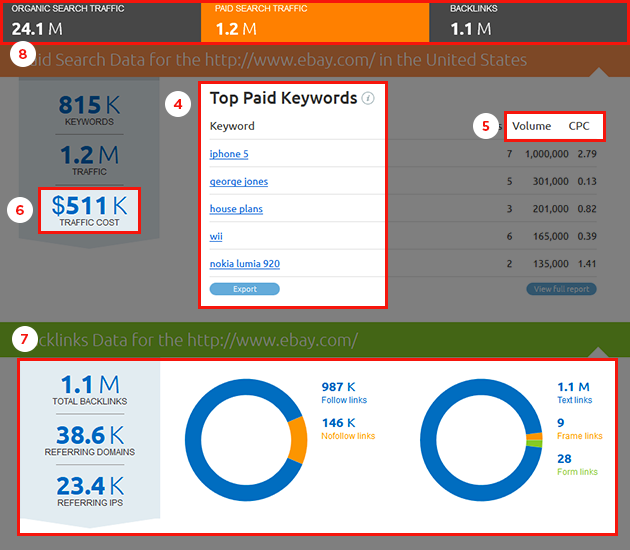 The Overview, Organic Search and Paid Search Reports also received some new widgets. The visuals represent the ratio between the queried URL and a domain's other URLs (9) in terms of the total number of organic or paid keywords, traffic distribution, and traffic price share. Explore new URL Reports and share with us your feedback by sending it at [email protected]. We’d be glad to get your comments and suggestions! The New Site Audit: More Color, More Visibility, More Information!